IOS device please download "iUSB pro" from APP store. Android phones does not need an app, but need to have OTG function. 2. If your Micro SD Card or TF card is FAT32 or exFAT format and could not be recognized by the app, please feel free e-mail our seller service. 【FOUR IN ONE SD CARD READER COMPATIBILITY】 - This Card Reader is great compatibility for all your devices. 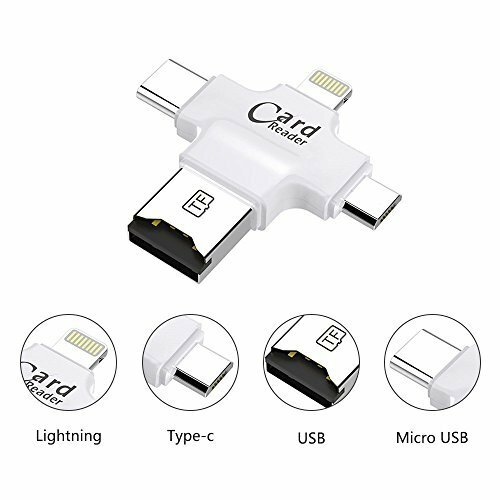 It has four interfaces: lighting connector for iOS devices; Micro USB connector for Android devices (with OTG); USB connecto for computers/Macs; Type-C connector is for Type-C devices. 【UNIVERSAL MEMORY CARD READER FUNTION】 - Support FAT32 and exFAT formats to read 8G~128G TF or Micro SD card (NOT Included). Reading speed: 20~27M/S; Writing speed: 11~20M/S. 【SPECIAL FUNTIONS OF VENSAN CARD READER】 - Transfer your important Photos, Music, Videos, and backup contact list; Secured private-Files encryption only support owner's device to read the data; Share the files on your Micro SD Card or TF Card using third-party apps shuch as Facebooks, Instagram,Snagchat, Twitter and more, like the photo or video in your gopro TF card, you can share it in few seconds. 【FREE APP FOR VENSAN USB CARD READERS】 - You could please download the free app named "IUSB Pro" from app store for IOS system. Android and Type-C Smartphones do not download app, please enter to the phone "file manager" to operate. 【WARRANTY OF VENSAN CARD READER 】 - 12 months worry-free product guarantee for every purchase from Wansun Elec. and always satisfied customer service 24h available. If you have any question in using and need professional technical support, feel free to contact Wansun Elec. Cusotmer Service. If you have any questions about this product by iDragon, contact us by completing and submitting the form below. If you are looking for a specif part number, please include it with your message.